The system originates more than 100 miles from its primary customers, in Yosemite National Park. O’Shaughnessy Dam was built on the Tuolumne River in 1923 to create Hetch Hetchy Reservoir. The water travels through a series of pipelines before it reaches the Bay Area and blends with five local reservoirs. The Tuolumne River joins the San Joaquin River and flows into the Delta. In 2012, advocates of restoring Hetch Hetchy Valley put a measure on the San Francisco ballot that would have required the San Francisco Public Utilities Commission to study draining the reservoir and shifting the water to other storage facilities. The measure was defeated. 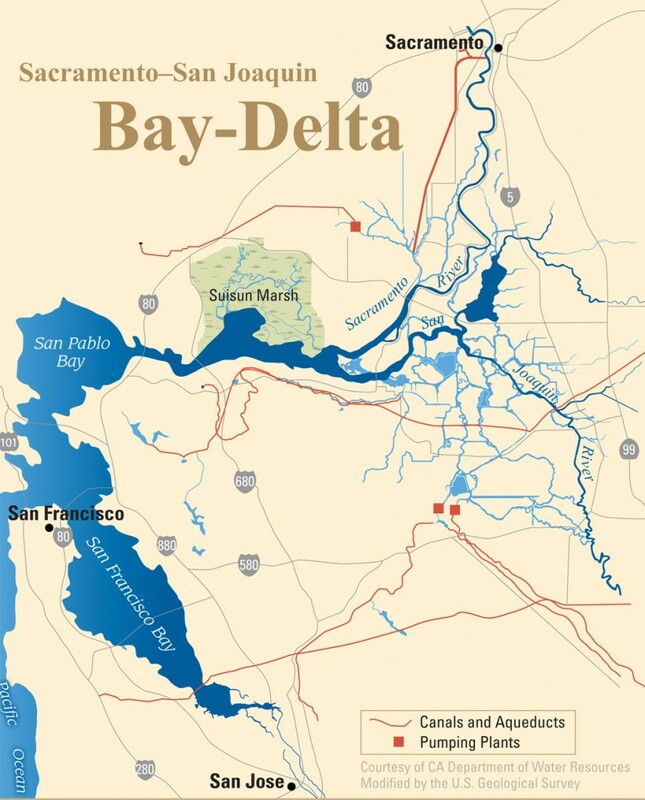 California’s two major rivers, the Sacramento and San Joaquin, fed by half a dozen others, come together in this inland delta just east of San Francisco Bay. The Delta’s watershed makes up about 45 percent of the state in all. Two-thirds of Californians use Delta water, delivered mainly through two major canal systems, the State Water Project and the Central Valley Project. With the prolonged drought, water officials have warned that there could be no water deliveries from either project this year, except for some drinking water supplies. The Sacramento-San Joaquin Delta has seen dramatic ecological decline due to habitat loss, invasive species and highly altered water flow. The 110-mile Russian River begins north of the Bay Area in Mendocino County and flows south until it reaches the Pacific Ocean west of Santa Rosa. There are three major reservoirs that are part of the water system. This river originates in the Central Sierra Nevada and flows west until it reaches the Sacramento-San Joaquin Delta and San Francisco Bay. The East Bay Municipal Utility District built Pardee Dam on the river near Stockton in 1929. Water is delivered to the Bay Area through the 85-mile Mokelumne Aqueduct, which diverts the river’s water before it reaches the Delta. The 23 mile-long reservoir was created in Napa County in the 1950s, when the U.S. Bureau of Reclamation built Monticello Dam on Putah Creek. Many water districts use water from the surrounding watershed. It comes from local streams and rivers, fed by rainfall or is pumped from underground aquifers. Some districts also recycle water, which is primarily used for landscape irrigation. Additional research by Shara Tonn.